Own Horrible Histories - Captivating Columbus DVD from Deff, DVD, Blu-Ray & 4K Video Specialists - Free UK Delivery..
Own Horrible Histories - Horrible Christmas DVD from Deff, DVD, Blu-Ray & 4K Video Specialists - Free UK Delivery..
Own Horrible Histories - Rotten Romans / Captivating Columbus DVD from Deff, DVD, Blu-Ray & 4K Video Specialists - Free UK Delivery..
Own Horrible Histories - The Specials 2 DVD from Deff, DVD, Blu-Ray & 4K Video Specialists - Free UK Delivery..
Own Horrible Histories Series 1 to 5 DVD from Deff, DVD, Blu-Ray & 4K Video Specialists - Free UK Delivery..
Own Horrible Histories Series 1 to 6 Complete Collection Plus Specials DVD from Deff, DVD, Blu-Ray & 4K Video Specialists - Free UK Delivery..
Delve deeper into the dastardly deeds of history’s greatest blockbuster rulers as this new series dishes up the much-loved revolting recipe of sketches and songs, peppered with gruesome gags and hideous hilarity. From Horrid Henry VIII and Naughty Napoleon to Crafty Cleopatra, Crooked King John and Tricky Queen Vicky, Series 6 is the most horrible series yet. Each episode takes a sideways look at the life and times of one prominent hist..
Own Horrible Histories Series 7 DVD from Deff, DVD, Blu-Ray & 4K Video Specialists - Free UK Delivery..
horrible Histories favourite, death of 'Stupid Death' fame, presents his very own show crammed full of spooky highlights. We meet him at home and get a good look around as he reveals his creepiest moments: a Tudor family show us the extent of their ghostly superstitions and the Vikings demonstrate how to become truly terrifying to your enemies. Death himself is joined by some rather creepy friends to sing about his favourite scary thing.. If you haven't experienced the gruesome gore, hideous habits and stupid deaths in Horrible Histories, you have been missing out on the most entertaining journey you'll ever take through the ages! This is history as you've never seen it: hilarious, fascinating and mind-boggling. Now the award-winning team behind the hit series is back with three spectacular specials just waiting to delight, surprise--and gross you out! Ridiculous Romanc..
History with the nasty bits left in! Based on the bestselling series of books for kids (and for adults, but they just won’t admit it), Horrible Histories is an anarchic, surprising and unconventional take on history’s most gruesome and funny moments. Foul facts, rotten rulers, beastly battles and evil inventions feature in horribly hilarious sketches, songs, cartoons and quizzes – all linked by the show’s host, a talking rat! From Woefu..
Own Horrible Histories Series 1 to 3 DVD from Deff, DVD, Blu-Ray & 4K Video Specialists - Free UK Delivery.. 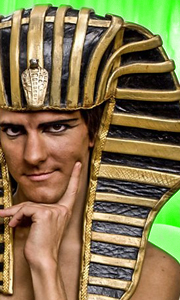 The award-winning Horrible Histories is back and as revolting and rotten as ever! Created by some of Britain’s finest comedy talents, Horrible Histories tells children all about the best bits of history and brings them to life with brilliant sketches, songs, cartoons and quizzes. Rattus Rattus and the gang are back with all the favourites, including Stupid Deaths, Historical Wife Swap, HHTV News and Ready Steady Feast along with fantast..
Own Horrible Histories Series 3 DVD from Deff, DVD, Blu-Ray & 4K Video Specialists - Free UK Delivery..
More gory tales, gruesome characters and the silliest stories from the past as the team give the history books another good shake... From the Awful Egyptians and Smashing Saxons to Vile Victorians and the Woeful Second World War, Horrible Histories brings you all your old favourites plus hilarious new sketches such as Historical Dentist, Wonders of the Universe and Historical Apprentice. We learn about Henry VIII's Cash in the Abbey, me..
Own Horrible Histories Series 5 DVD from Deff, DVD, Blu-Ray & 4K Video Specialists - Free UK Delivery..